ISLAMABAD — After an acrimonious campaign, polls opened in Pakistan on Wednesday to elect the country’s third straight civilian election — a first for this majority Muslim nation that has been directly or indirectly ruled by its military for most of its 71-year history. Rights groups have warned that the rancorous campaign and widespread allegations of manipulation imperil the wobbly transition to democratic rule and raise the specter of bitter post-election challenges of fraud. The unprecedented participation of radical religious groups, including those banned for terrorist links but resurrected and renamed, has also raised fears the space for moderate thought may shrink further in Pakistan. Attacks against minorities have increased in recent years. One candidate, Jibran Nasir, an independent from Pakistan’s financial hub of Karachi, received death threats and even had a fatwa or religious edict issued against him after he refused to condemn Ahmadis, who are reviled by mainstream Muslims as heretics because they believe the messiah promised in Islam arrived over a century ago. In Pakistan it is a crime for an Ahmadi to call himself a Muslim after a 1974 constitutional amendment declared them non-Muslims. “I am speaking for the millions of Pakistanis who are too afraid to confront religious bigotry,” he said in a telephone interview. He also said that no arrests have been made of those who threatened him. The leading contenders in Wednesday’s polling are former cricket star Imran Khan and his right-of-center Pakistan Tehreek-e-Insaf Party or PTI and the right-of-center Pakistan Muslim League, the party of disgraced Prime Minister Nawaz Sharif, who is in jail serving 10 years on corruption charges. His younger brother Shahbaz Sharif took control of the party. The third-largest party in the running is the left-leaning Pakistan People’s Party, headed by Bilawal Bhutto, the son of late Prime Minister Benazir Bhutto, assassinated by Pakistan’s Taliban militants, whom she had vowed to eradicate. Election officials say more than 11,000 candidates are vying for 270 seats in Pakistan’s law-making Lower House of Parliament and 577 seats in four provincial assemblies. The 85,307 polling stations opened at 8 a.m. and will continue for 10 hours, an hour longer than in the 2013 polls. Voting for two parliament seats and six seats in provincial assemblies has been postponed due to attacks on candidates or disqualifications. There are 105.96 million eligible voters in Pakistan, with 59.22 million men and 46.73 million women. Pakistan’s election commission reminded candidates their elections will be nullified if the female voter turnout does not reach 10 percent. The requirement was imposed after the 2013 elections when several areas banned voting by women, mostly in Pakistan’s religiously conservative northwest. Some candidates were elected without a single woman marking a ballot. The commission issued its reminder Tuesday after veteran rights activist, Tahira Abdullah, said local jirgas or councils of elders from 60 areas of the country, representing 16 different constituencies, had signed agreements banning women from voting. Citing security worries, the election commission announced internet and mobile phone services in several districts in southwestern Baluchistan province has been suspended because of security issues. Some of the worst violence during campaigning occurred in Baluchistan, where earlier this month a suicide bomber devastated a political rally killing 149 people including the candidate, Siraj Raisani. Voting in that constituency is suspended. Election commission secretary Babar Yaqub, told reporters late Tuesday that threats against polling stations, staff and even candidates have been received. His statement came just hours after militants lobbed grenades and opened fire at a military convoy escorting election staffers and voting material in Baluchistan’s district of Turbat, killing four troops. 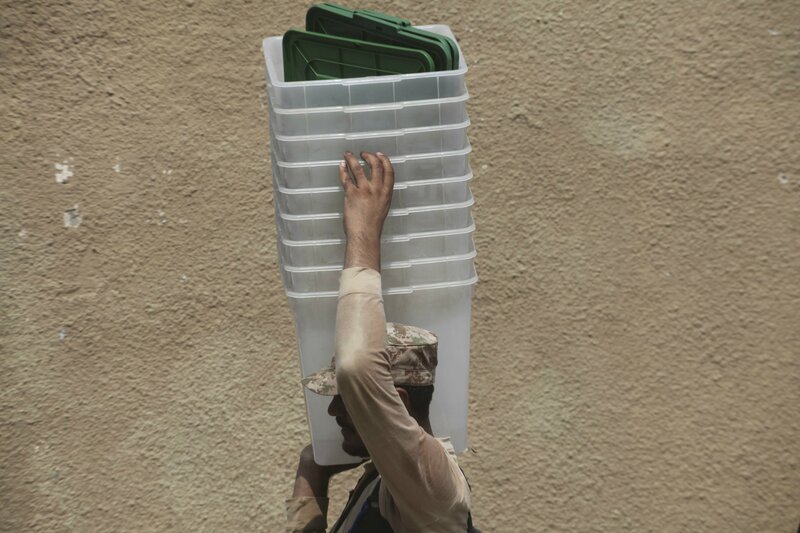 At the request of the election commission, Pakistan’s military is deploying 350,000 troops countrywide outside and inside polling stations. International and domestic election observers will monitor voting. The European Union Election Observation Mission has 120 monitors at polling stations in major centers across Pakistan, with the exception of southwestern Baluchistan province where a suicide bomber earlier this month killed 149 people, including a candidate. Voter turnout in 2013 was 54.8 percent.